As a maker I am influenced greatly by the process and am very happy to let the making process influence the design process, accidental discoveries along the way will often take me in new and entirely different directions. I enjoy the path as much as the destination,maybe even more so. I have a quirky sense of humour and a unique way of seeing because of it. I am inspired by nature and the phrase “implied symmetry” the same same difference of two leaves, trees, or pair of rocks, by modern architecture with open spaces and closed boxes. I like to see the makers hand, the brush strokes and file marks. Of my own practise I can say I have a strong sense of movement and incorporate this into my work through articulation and in form, my pieces move with in them selves or have a sense of movement off the form, elements escaping their boxes. I often incorporate colour as a design feature and enjoy investigating different processes of achieving them, I enjoy investigating different processes period! I will often make a piece just so I can use a different process, new tool or technique. It is the making that is most valuable to me! The process of creation and investigation. In jewellery and object I have found a sanctuary, an illuminated path to follow, a home for my curiosity. I have always been a tinkerer, dawdler, observer and maker! 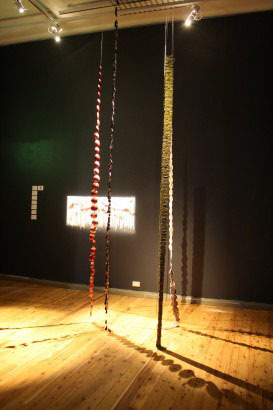 Felix Gill, broken links and loose connections, Instillation of long chains. 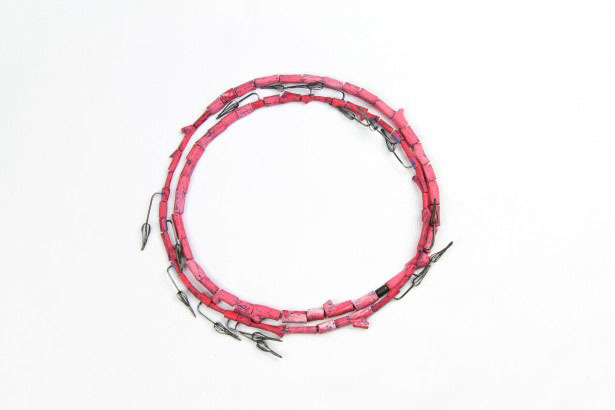 Anodised Aluminium, Felt, Red Thread, White chain.